Deletion and modification seem to confuse students. Additive methods appear easier in my experience. Over the next few posts I wish to present a few tweaks I have used to get my students past sticking points whose existence I have struggled to understand since I was certain I had already broken it down to the simplest form. In my practice these tweaks have been extremely potent. I would like to hear about any other special fixes people have found for the other areas of difficulties. I am not entirely happy about resorting to these techniques. The ability to use harder or conventional solving techniques is essential since not everything can be designed to be simpler. Alternative resources will use common methods rather that Mr. Masri’s Secret Recipe. However, we are all pressured to ensure our students pick up skills that will allow them to understand their subject, even if it means sidestepping basic cognition. Even the explicit instructions written in large letters do not deter the students. I would stand right beside them and watch their furrowed brows. They were unable to see any new possibilities. This will happen even with worked examples, physical demonstrations, and electronic aids. They will cycle through these three options before finally committing one of these mistake. With modification baked into the method, the student has to remember a larger myriad of rule regarding sanctioned and unsanctioned modification. Adding a whole molecule to address an imbalance of a single atom seems inefficient. While I can get the students to agree to the basic precepts that what they are doing changes the reaction fundamentally the link between the concepts and the method remains perfunctory to all except the brightest. Is it possible to bake into the method a recognition of this fact? This was not a method I had developed myself. In retrospec is is incredibly obvious. My students had a for a very long time performed well on the PHET balancing equations simulation but failed miserably with the paper method. 1. List out the the elements. Count the atoms for each element and place inside the table. 2.See which side has fewer atoms of one element than the other. 3. Modify the equation. In this case add another CO2 by writing 2 in-front of it. 5. Repeat step 2 3 and 4 until both the reactants are product have the same number of atoms for each element. Repeat 2. See which side has fewer atoms of one element than the other. Notice that the are fewer oxygen atoms on the left hand side than the right hand side. Repeat 3. Modify the equation. In this case there are two molecules that can provide the oxygen needed. Increasing either of them will break the current balance for C and H.
In cases it usually does not matter which you increase first because you will end up increasing both. A good rule is to do the one with an element that is not O or H.
There are 15 cancellations with this normal method. It is not a wonder someone non-confident students would question their technique. They are also required to keep swapping between the table and their formula repeatedly. There are also require to directly modify the line of the equation but only in a specified way. While this is quite simple it is part of a 6 step process. Now lets see a different method that has fewer steps, eliminates any need for cancellation, requires no swapping and demonstrates the preservation of the reaction. 1. Look at the elements and count and see which side has less. Whichever side has less, add another of that whole molecule. In this case there are fewer carbons on the left so write the whole molecule that has carbon in it again below. 2. Repeat step 1 until neither side has fewer atoms. In this case carbons are balanced but there are fewer oxygen on the right hand side. In this case carbons are balance but there are fewer oxygen on the left hand side. A smarter student might be able to see adding another CO2 will keep this discrepancy of odd and even number of O but it does not matter. It is an advantage in almost every single way. Number of cancellations zero. Focus is always on the same construct. No modification to cascade through to a separate construct. Assuming the page is large enough, there is no running out of space because the original formula/table was written too narrowly spaced. I am not satisfied with the fact that what I consider a reasonable method is a constant source of confusion for many students. 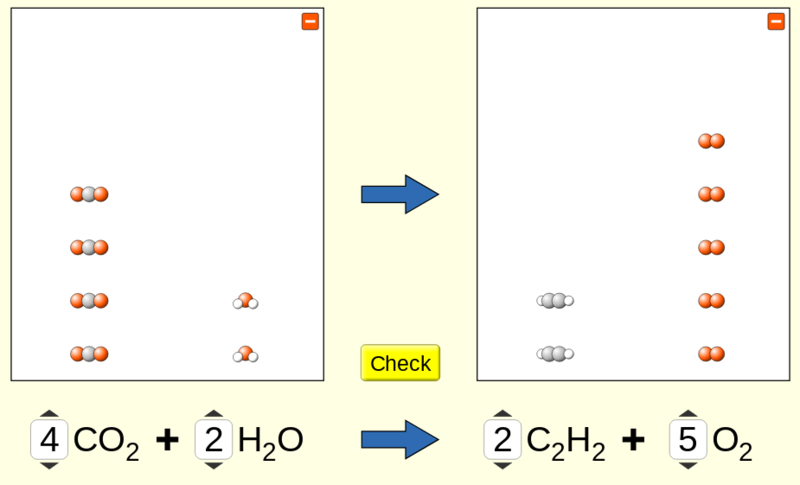 Even when breaking it down and demonstrating the relative complexity between these two methods it should be within the capacity of any student to NOT change the molecules. The skill to follow instructions is entirely side stepped so cognitive development is ignored. However, now the student is able to progress in chemistry with a method that structurally reflects what we are solving. I gave a talk at the open source hardware user group recently titled “The Needs of Others”. It was half outlining what is known about the effective delivery of technology aimed alleviating technology and half talking about how faithful reproduction of physical objects at any reasonable scale is dependent good documentation and then exploring the challenges all int he context of Free and Open technology. Unfortunately I only had 20 minutes while it was at least an hours worth of talking. I really enjoyed it and the other two talks we great. You can see my notes if you download the file. It’s been a good long while since my last post. In truth I am not a blogger by habit. I do things, or I think about doing things. Writing about the things I am doing or thinking about is a forced action for me. Ironic in light of the documentation bent I am pursuing. I recently applied for a job. Both shocking to those who know me that I could muster up the effort and attempt to pursue something resembling a typical life path, and shocking to those who don’t for that this should stand out as anything remarkable. Surely for all my whining about having no money or job I should pursue gainful employment with all the vigour afforded to me by my body in the waking hours. A quick update over what has been happening with the documentation project and why I’ve been quiet. I’ve added some of my work to http://www.appropedia.org/Hexayurt_Plywood . Images to be added as I make ones I am happy with. I’ve got an exciting new project that I hope to launch within a week so stay tuned. Still need to name it. Self indulgent teaser here.